This study shows simulation results of 137 Cs deposition released from Fukushima Daiichi Nuclear Power Plant Accident on March 12, 2011. 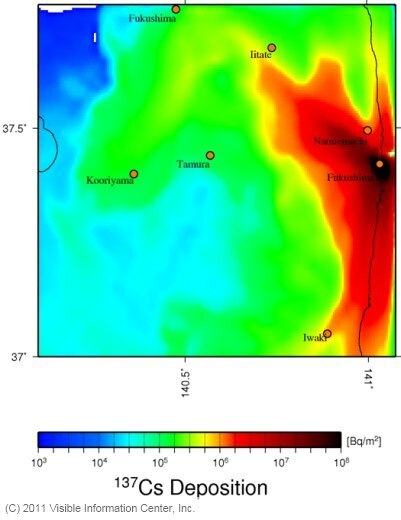 The soil concentration distribution of the simulation reproduced the distribution in the vicinity of Iitate-mura and Koriyama well. 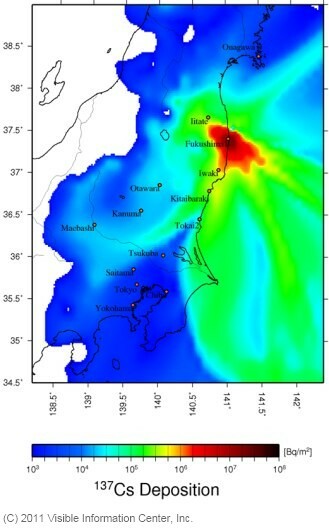 However, some discrepancy was found, for example, simulation results showed relatively high concentration while measured data was relatively small in the vicinity of Iwaki. ※1：Based on dust sampling results at different places, reconsideration is ongoing. ※2：Precipitation map made from AMeDAS data was derived and applied because precipitation data produced by a meteorological model was not sufficient. Comparison to measured data was conducted using soil concentration (publicly available) of each city in Fukushima prefecture measured by Fukushima prefecture government (See Fig.2). 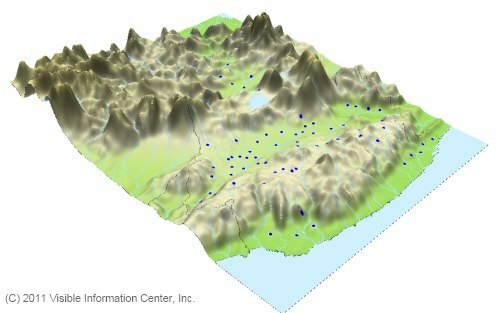 Measurement points are shown in Fig. 1. Fig. 1 Measurement points for radioactive material in soil in Fukushima prefecture. (a) Measured soil concentration of 137Cs as of April 6th, 2011. Fig. 2 Comparison of 137Cs integrated deposition [Bq/m2] between measurement and calculation in Fukushima prefecture. Fig. 4 shows the time series of calculated integrated deposition. 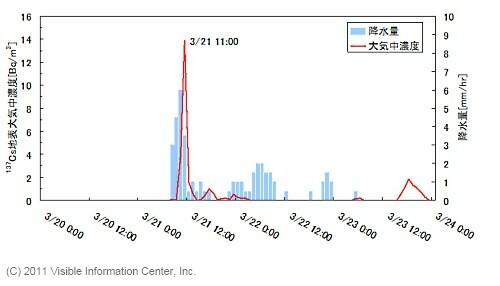 This figure evidently shows 137Cs deposition occurred from March 15th to 16th and March 21st in the greater Tokyo area. 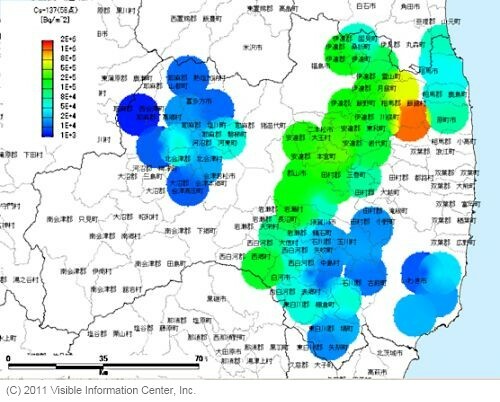 It is estimated that radioactive plume released from Fukushima Daiichi Nuclear Power Plant passed the greater Tokyo area by north wind and east wind from the Pacific Ocean on March 15th (Refer to the concentration distribution). Similar wind directions were observed on March 21st, with the addition of rain in the greater Tokyo area. Calculated time series of 137Cs ground level air concentration at Kashiwa City Hall overlaid on measured precipitation at nearest AMeDAS in Abiko is shown in Fig.5. The peaks of air concentration and precipitation were in good agreement on March 21st in Fig. 5, therefore it suggests that most of total amount of 137Cs deposited in Kashiwa was caused by precipitation which occurred from 10:00 to 12:00, March 21. 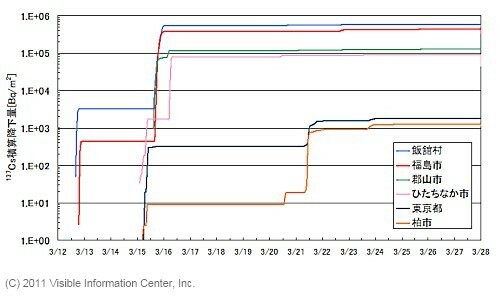 Time series of 137Cs deposition calculated at various locations in Fukushima and the greater Tokyo area. Fig. 5 Calculated 137Cs ground level air concentration at Kashiwa City Hall and measured precipitation at nearest AMeDAS in Abiko. Misspelling corrected for Abiko in Japanese Kanji letters.